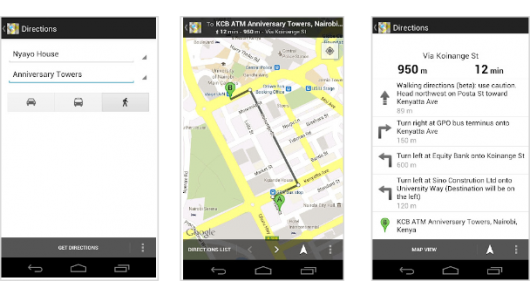 Google has just announced an update for its popular Maps service, extending support for walking directions to 44 African countries. Following the mandatory safety warnings that come with the beta tag (routes may be missing pedestrian crossings etc. ), Google is encouraging residents to try out the service, available today on both web and mobile. A separate update will no doubt be appreciated by cyclists in Europe and Australia. As the African continent develops, there should be no shortage of users for the mobile version of the service. Telecoms & Media reported last year that Africa is now the second most connected region in the world in terms of its mobile subscription count. There are currently more than 500 million mobile users on the continent, and by 2015, there are expected to be 265 million mobile broadband subscriptions in Africa, a significant increase from the current estimate of 12 million. Support for cycling directions has also been improved. Previously only available in the US and Canada, the service has now been extended to both Australia and Europe, just in time for the yearly post-Tour de France cycling enthusiasm. Routes devised for biking are designed to make use of dedicated bike lanes and avoid significant hills whenever possible.